Find The Exact Cause Behind Your Itchy Palms And Soles! Home Beauty & Skin Care Find The Exact Cause Behind Your Itchy Palms And Soles! Itchy palms and soles can leave anyone in an upsetting state. It could also be publicly annoying to have palms and soles at itchy condition. Itchy palms and soles, also termed as Palmoplantar pruritus have multiple causes like dry skin, atopy, allergic reactions, certain systemic or some skin diseases. You might experience itchy palms and soles with or without any obvious skin rashes. Thus, its causes are broadly divided into two types- exogenous and endogenous. Let us have a brief check on its causes. 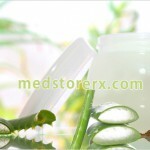 Infections: If secondary infection of a wound on the palms and soles are not treated promptly, it can cause dermatitis. The infectious elements act as antigens, which produce inflammatory skin changes resulting in itchy soles and palms. Contact Dermatitis: Food dermatitis and hand eczema caused by irritants like soaps, detergents, cosmetics, and allergens like rubber and nickel can trigger severe itchy palms and soles. Exposure to fiberglass, paints and solvent can also cause itchiness in palms and soles. Sudden itching in hands and feet can be the result of ingested seafood or certain medications like sulfa, penicillin etc. 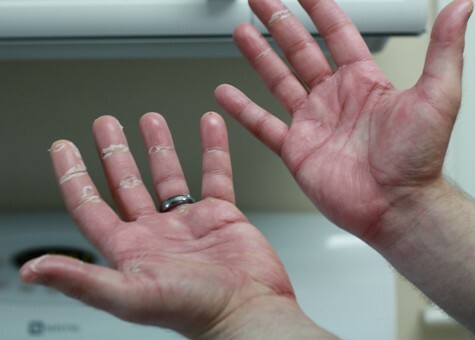 Secondary Dissemination: A pompholyx (a type of eczema) or secondary ide eruption caused due to fungal infection in a remote site can trigger itchy and severe painful outbreaks on the palms and soles. Usually the source of itching palms and soles appears to be external. 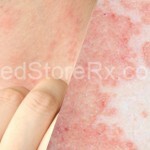 But in certain cases, there are many internal irritating tendencies too that causes itching problems. These are known as endogenous causes. Endogenous causes for itchy palms and soles are difficult to ascertain. They can also be due to systemic and psychological disturbances. Systemic: Disease of the liver and kidney, blood disorders including leukemia, polycythemia Vera, multiple myeloma and Hodgkin’s lymphoma, endocrine disturbances hypo or hyperthyroidism, cutaneous mastocystosis causes general itching that even spreads into palms and feet. Itchy palms and soles may also present a symptom of Crohn’s disease or HIV infection. Aquagenic pruritus, senile pruritus, and atopic dermatitis do cause itching sensation all over the body, including palms and soles. Psychogenic: Anxiety and stress can aggravate and induce the persistent itchy state of palms and soles, in the lack of any skin rashes. Idiopathic: Many times, itching of palms and soles occurs without any apparent symptoms. This is termed as idiopathic itchy palms and soles. Dyshidrotic: If a person is affected by Palmoplantar hyperhidrosis (the excessed sweating of palms and soles), can trigger eczematous scratchy dermatitis thereby causing itchiness on palms and soles. Vitamin Deficiency– Lack of vitamin in the body, especially vitamin B1, B6 and B12 can cause itching and burning sensations on the soles and palms. Scabies: This contagious itchy condition occurs due to the mites that burrow under the layer of the skin. Typical nocturnal irritation and itching of the hands, particularly on the finger webs, may be a sign of scabies. Lichen Planus: this condition can trigger severe itchiness on the palms and soles, along with pigmented or violaceous skin rashes. Ringworm Of The Hands And Feet: Scaly rounded itchy patches of skin involving both hands and feet occur in ringworm infestation. At times the scales are very delicate and at other times hyperkeratotic and thick. Palmoplantar Psoriasis: thick painful, scaly plagues with sore fissuring and changing grades of itching and irritation can occur in psoriasis. This condition can affect palms and soles as well. 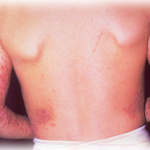 Candidal Intertrigo: this condition is most commonly seen among hairdressers and homemakers. Candidal infection affects the web spaces between fingers and toes thereby causing inflammation and itchiness in the area. However, the treatment of this condition is taken according to the cause of irritation. At times, both the doctor as well as patient are confounded when the itchiness in palms and soles occur without any visible skin changes. So, basically one has to detect the actual reason at first to adopt any treatment. An appropriate medication should be taken from the expert physician to get free from the irritating nuisance of itching palms and soles.